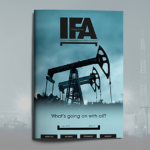 If you’re picking up this month’s edition of IFA Magazine in the vague hope of finding some detailed, sensible analysis of what is likely to happen to the UK and EU markets and economies in the near future as the Brexit shambles keeps rolling on, I am sorry to have to disappoint you. you this month. We’re grateful to Damien Rylett, Ryan Hughes, Tony Catt and Brian Tora for sharing their views on different aspects of investing for income. In his snappily named rant, Oil be blowed, Mike Wilson is looking at what is going on in the oil market but whether you’re an oil investor or not , his analysis and perspective gives plenty of food for thought on markets more generally in the months and years ahead. Back in December, we interviewed Barry Downes of Sure Ventures. I’m pleased to say that we are following up on this with a more detailed look at some of the case studies which clearly show the potential which exists in this exciting investment sector. Also on a more specialist area, Invesco are highlighting the attractions of blockchain as an investment concept as part of a balanced portfolio. Building and maintaining your competence in technical and market knowledge is one thing, but when it comes to the business side of financial planning, there are always ideas and tips that can prove helpful to even the most experienced financial planner. Business development is a favourite topic amongst IFA Magazine readers. This month, we have a series of different articles on this subject which we hope will get you thinking. A fundamental part of running a successful financial planning business is getting your charging right. We’re grateful to Brett Davidson for his insight on this particular topic in his article on page 10. Another core ingredient for a successful business is recruiting the right people in your team. This topic is on Tracey Underwood’s radar as she uses her experience to give practical tips on how you can boost your success at recruiting talented individuals into your business. She also has tips for those who may be on the other side of the table – the interviewees – to boost chances of a successful “match” and a win-win situation. . If you’re keen to build relationships with professional connections – solicitors in particular – Michelle Hoskin has plenty of practical advice as she delves into the subject and looks at the importance of standards. As always, we extend our sincere thanks to all our contributors this month and hope that you, our readers, find some useful ideas as you digest the content of the pages ahead.